I needed something to cheer me up today, so I pulled together a January wish list, even though it’s already the middle of January. Admittedly, I could have saved all of these things and used them in this week’s Friday Five (and next week’s, too) but I want to try something different on Friday. Also I’m greedy enough that I could probably still come up with a Five in two days if I had to. The colors coordinate so well together, lots of earth tones and monochrome, which was a totally unintended side effect, I promise. Apparently that’s just my aesthetic this month. I’m desperate for a polka dot blouse and a new pair (my third!?) of glasses, but the show stealers here are the Byredo candle that smells like a library (or not, but the name still gets me) and a new kitchen mat that looks like a French café menu board. A Ballard Designs catalog appeared in my mailbox yesterday and I instantly fell in love with the mat and those Eiffel Tower push pins. If you had to pick one item, which would you choose? I love that polka dot shirt! Your taste is impeccable! What I want the most out of that bunch? The teapot. Tea has gotten me through this winter and I’m about to go teapot-less in T-minus ONE DAY. Gah, I really need to get shopping. I’ll take the polka dot shirt, please! oooh, can’t i bundle? those boxes are beautiful and i love boxes to hide myself in (also love b/w with warm earthly wood tones). but then’s there’s that floor mat and i have just never seen one like it before so i feel like i would have to choose that. but that candle, oooo, the name makes me want to hide it in my coat and run with it. ooooh, i like games like this… i actually love the clean lines & simplicity of those ikea boxes… i could actually see them in the kitchen… store tea inside & a little cup & saucer & strainer on top… great for b&b’s actually! 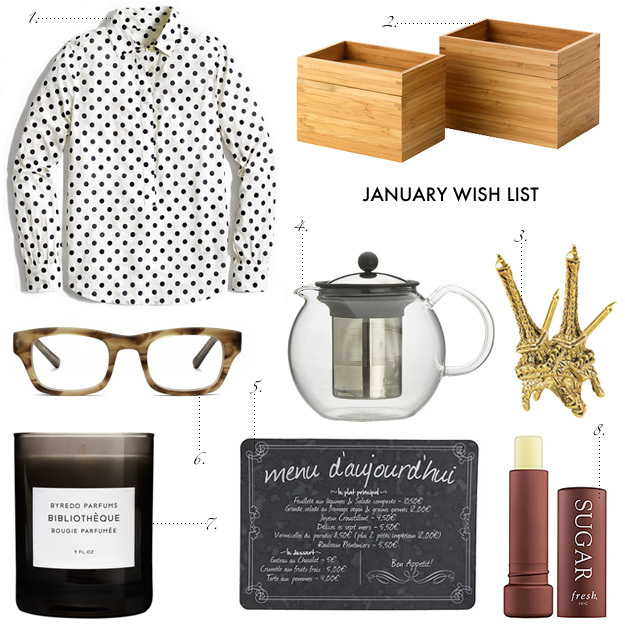 & i like the candle (love to take a whiff of that) and the glasses as i haven’t updated mine since circa 1999! haha! oops! Well, if I had to pick only one, the glasses- fun! But I will say, I think mid month is the perfect time for a wish list: you’ve had some time to look things over, and you’ve got some time to go shopping! I’m in love with that mat!! I have a chalkboard in my kitchen because I am obsessed…the mat would be perfect. This is a classic Erin wish list! Love love love it! The push pins and glasses are my favourite!